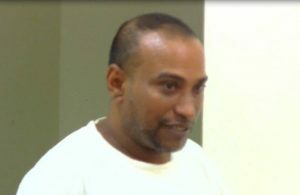 An East Coast Demerara father was Thursday arraigned before Magistrate Alyesha George in the Sparendaam Magistrates Court this morning om a charge of the murder of his son. Forty year old Omar Khan of Lot 8 Better Hope Railway Line was not required to answer to a charge which alleged that on May 5, 2017 at Better Hope, he murdered Azeem Khan called “Orlando”. While in the prisoner’s dock, the first time offender was seen weeping. The man, who was not required to plea to the indictable charge, was remamded to prison until June 28, 2017. His 18-year old son died last Friday at the Georgetown Hospital, one day after being rushed there in an unconscious state. At the time, the 40-year-old father, claimed that the youth had fell from a ladder at his place of work. However, a post-mortem examination found that the young man died from hemorrhage, due to blunt trauma to the head. The father was called in for questioning by the Police and after told of the findings of the post mortem, he reportedly admitted to hitting his son across the head with a piece of wood during an argument. The prosecutor is Inspector Alexander.